On the night of November 4, 2008, the Newton County citizens elected Ezell Brown as their Sheriff for the Newton County Sheriff’s Office. On that historic evening, Brown responded to the citizens by saying, "I feel great. I feel like the citizens did the right thing. We made a lot of promises to the citizens of Newton County and I plan on making them come true." 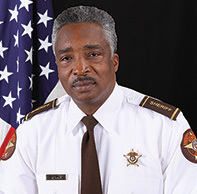 Sheriff Brown took office in January 2009. In less than 8 months, he moved forward quickly to implement several programs to improve the functions of the Sheriff’s Office and improve the quality of life in Newton County. Sheriff Brown has accomplished this by using his employees’ individual talents and experiences without having to increase his personnel. Having to do more with less, the Newton County Sheriff’s Office will continue to provide the best quality service for its citizens. Sheriff Brown has embraced his role and commitment to his community and has made tremendous progress. He has done much to lay the foundation for “improving the quality of life in our community” and has done so in a short period of time. Sheriff Brown will continue to uphold the mission of the Sheriff’s Office and implement practices, procedures and programs that reflect our ever changing community. We now live in a multi-cultural diversified community which requires planning, training and additional resources to meet this challenge. The Newton County Sheriff’s Office traveled to New Orleans, LA to attend the American Correctional Accreditation (ACA) conference to receive their recertification award. NCSO received a perfect score of 100 across the board on all 300 plus standards during the onsite audit in November 2018. Other attending agencies as well as the auditors were amazed and raved about the outstanding accomplishments of NCSO and asked if outside agency members could sit in and observe the panel Q & A on Saturday, January 12, 2018 with the Newton County Sheriff’s Office. The session is private and usually closed to the public. However, in an effort to provide valuable information to those aspiring to receive exceptional scores during the review process, the observation was made allowable. Those in attendance from Newton County were Sheriff Ezell Brown, 1st Lt. Brice Smith, Lt. Selena Williams, Yvonne McMullen and Chairman Marcello Banes. NCSO received their initial ACA certification January 2016. Concluding the session, NCSO received a standing ovation from the crowd as well as the review panel. Other agencies have requested to shadow NCSO to aid them in their upcoming ACA review process. Sheriff Ezell Brown would like to personally like to thank Chairman Banes for his attendance and support. It has been an honor and privilege to “serve and protect” as Sheriff for the citizens of this great county for 10 years. The Newton County Sheriff’s Office has achieved many accolades over the years, and my desire is to continue the great work. In order to do this, we first have to remember where we came from, recognize how far we have come and dedicate a plan in working together in the future. Where we came from: In 2000, Newton County’s population was 62,884. By 2007, about a 1¾ years before my term began, our population rose to 96,019 and was considered the 23rd most populated county in the state of Georgia. During that time, NCSO had roughly 55 patrol deputies on the roster, which was under the required amount to effectively operate. In addition, Newton County has been behind the market rate in salaries for more than 10 years. In the 2009-2010 fiscal year, the county placed a freeze on all hiring, incentive pay, merit and cost-of-living increases for all employees due to a downturn in the economy. During that time, we were operating with a little over $19 million budget. NCSO lost over $1.2 million in budget funding and 23 employees due to layoffs and budget cuts. This left NCSO operating on a $17 million budget. That alone placed us as non-competitive with surrounding counties. However, as Sheriff of Newton County, I had a plan and the drive to overcome the challenges we were facing. How did we get here: As Sheriff, I have and will continue to strive towards excellence for NCSO, Newton County and its citizens. The goal towards excellence included becoming a gold standard agency, building a bridge between the community and law enforcement, creating safe communities and getting fair market pay and retirement for my employees. I can truly say to the citizens of Newton County that our work together has yielded the fruit of excellence. Currently, the Newton County Sheriff’s Office has not only attained the gold standard status we sought, we have bypassed it through attaining gold standards with all 3 national entities: National Commission on Correctional Health Care (NCCHC), American Correctional Accreditation (ACA), and Commission on Accreditation for Law Enforcement (CALEA), making us a “Triple Crown” agency with the National Sheriff’s Association. We are one of 4 agencies out of 159 sheriff’s offices in Georgia with the distinction of Triple Crown, and in the top 40 in the United States who have achieved this status. Also, we have attained state certification through Georgia Chiefs of Police. NCSO has implemented an array of programs that assist in rehabilitating inmates before being released back into the community to include: Residential Substance Abuse Treatment (RSAT) program, Creating Healthy Options Increase Choices to Effective Solutions (CHOICES), Parenting, 12-Step Addiction Recovery, Mental Health Treatment, etc. We are heavily involved in HOA neighborhood watch programs through our Community Outreach division, and implemented programs that give back to the community such as: Back to School Supply Giveaway, Sheriff’s Guardian Angels-Toy Ride and Toy Giveaway, Feed the Hungry and the Random Act of Kindness Initiative by Deputies Who Care. We have awareness and education programs such as Choosing Healthy Activities and Methods Promoting Safety (C.H.A.M.P.S.) which has graduated over 19,000 5th graders, written literature to educate the elderly on fraud and scams and our community clean-up programs, which removed tons of litter from Newton County. How we will excel in the future: Working together on future endeavors for 2019 and beyond, our goal is to make sure we continue to effectively and efficiently “serve and protect” the citizens of Newton County. As we move forward, we will continue to maintain our level of excellence by retaining our national “Triple Crown” status. We will continue to work on bridging the gap between the community and law enforcement by providing elite training to all our employees, so that we possess the highest level of skilled personnel. Through the use of modern technology and upgraded equipment, we will continue to combat crime, retain quality personnel and make sure we provide services that assist in the rehabilitation of inmates before releasing them back into the community. I am proud of our county, citizens, deputies, first responders, business owners and community leaders in Newton County. There is no other place I would rather be than right here with all of you. Thank you for allowing me to be your Sheriff, and I look forward to our continued work together. First and foremost, I would like to thank each and everyone of you for your patience as the county moves forward with the compensation and classification study. However, I had little to no input in the study and as most of you are aware the person who initiated the study passed away midways of completing it. Therefore, the new team having to start from zero to where they are today, may or may not have benefitted most of you. If you would allow me to be your leader, my plan is to readdress the compensation study based on the comp and classification questionnaires submitted. This process does take time and each position has to be individually evaluated. As you know, the Sheriff’s Office is the largest employer in Newton County with 270 plus employees. Therefore, I ask for your silence and patience as I work through addressing this issue. If you have any concerns other than what has already been stated in the questionnaire you submitted, the step plan or how you were placed in the step plan, please forward those concerns directly to me. Most of all, I ask for your patience. Let us all thank the Board of Commissioners for all they have done for us up unto this point.